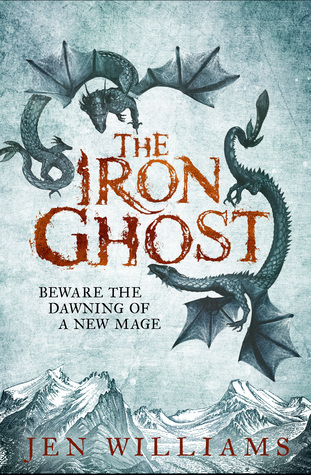 The Iron Ghost was the second of three in The Copper Cat trilogy and it brings back characters from the first book The Copper Promise in full force. This story follows the Blackfeather Three as they travel to a place called Skaldshollow to assist the Skald people in getting back a stolen artefact. As soon as they arrive things start to go wrong and The Blackfeather Three come face to face with trials and tribulations to rival their exploits in the first book. Ice people, wyverns, crazy mad mages with a thirst for blood and a familiar yet hated demon child all abound and cause all sorts of trouble for Wydrin, Frith and Sebastian. There’s a neat – if slightly unobvious – split between tenses in this book which was slightly off putting; for example it’d be one chapter in present day Skaldshollow and then the next would be set in the past usually with Sebastian at the Order Temple. It wasn’t bad only unclearly marked, but on the flip side the writing itself showed the tense changes really well. As with the previous book everything that could go wrong went wrong but the plot line followed a set rhythm that deviated in the smallest of ways but also the biggest – by this I mean that the plot stayed on the same sort of course but then all of a sudden something that was unexpected was thrown in the works and it threw me for a loop. Other than Bezcavar the new big bad in this book was a long dead mage by the name of Joah Lightbringer or Joah Demonsworn who is miraculously brought back to life by the help of BBezcavar(surprise surprise) so he can continue on in his great, albeit incredibly insane work. There’s magic galore from Frith, Joah, the Skaldshollow, Bezcavar and even Sebastian! Something happened with Wydrin that I won’t spoil for any of you who haven’t read this book (I highly recommend it!) that completely threw me and made me keep reading until the early hours of the morning. I had a combined “What the hell JW” and “Oh thank you, thank you” moment. I’m about 110 pages into the third and final installment. I had a heart crumbling moment when Jen told me that on Twitter but made up for it with a pre-order of her new book.